I was recently reading an article on Mashable when I came across some consumer statistics I thought I would share with you. The consumer research was done by Exact Target and they compiled statics into how consumers interact through email, Facebook, and Twitter in the Social Break-up . The article offers insight into three marketing channels, but I found the email statistics especially useful. 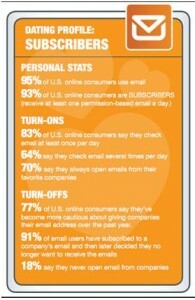 Today, many small businesses rely on email for effective communication with consumers. The article noted that 95% of consumer use email and 93% of online consumers subscribe to at least one email a day. This email relationship with consumers and businesses is built on trust. With the growing use of email, subscribers have become much more hesitant about giving out their email address to businesses. Once you have built up enough trust with a consumer to get him or her to subscribe to your emails, a new challenge arises: how to keep these subscribers and prevent them from simply deleting, or worse, unsubscribing from your emails. 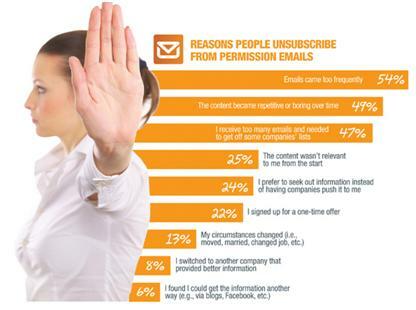 54% of customers unsubscribe due to emails that came too frequently so it is vital that your business respect permissions and exercise control in the number of emails you send out to customers each week. Another stat to take note of is that close to 50% of people unsubscribe due to repetitive or boring content. This practice can be harmful to your email campaigns. If you create and continuously distribute sent lackluster and emails you are hurting the consumers trust you worked hard to gain as well as risking the chance of losing email contact with consumers. Therefore, your email marketing campaign should focus on creating emails that involve relative and interesting content that will encourage customers to not only open the email, but take the time to read the information you provide. Also, if you work to engage your customers in an email make sure you have an effective response in a timely matter to show your customers you do care about their participation and it is not a waste of their time. The reality is consumers have quickly become advanced and informed when it comes to email marketing and therefore have set higher expectations for “trustworthy” emails. According to the Social Breakup, 77% of online consumers say they’ve become more cautious about giving companies their email address over the past year. As a small business, you must work to create emails that are targeted, personalized, and relevant to the customers receiving them. You need to have a clear understanding of your audience and their needs in order to create effective messages that will interest and engage them. Failure to do so will quickly result in an unsubscribe as poor email marketing is not tolerated by consumers. Your business is not simply competing with others in your industry; consumers now compare each email you send to all emails they receive. How do your unsubscribe numbers look? 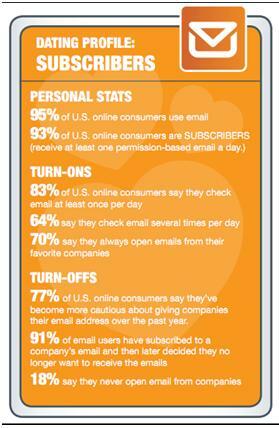 Do you have any useful tips that you utilize to prevent customers from unsubscribing to your email? We would love to hear from you! This entry was posted on Wednesday, February 9th, 2011 at 2:54 pm	and is filed under Industry News. You can follow any responses to this entry through the RSS 2.0 feed. You can skip to the end and leave a response. Pinging is currently not allowed.